As we all too slowly leave the winter chill behind, the kiss of spring revitalizes us after our long hibernation. 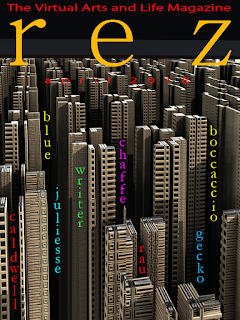 It’s no different with this month’s issue of rez, where our talented collection of seers and sinners helps us awaken our senses. This month, Art Blue walks us through Gem Preiz’s new art installation at LEA29 called Demiurge, an impressive exhibit that looks back as well as peeks into the future. Gem finds a few nooks to exhibit his phenomenal fractals, too. You must stop by and take it all in. Cat Boccaccio, who says more the fewer words she uses, tells a girl-power story in Just a Girl, which might have been appropriate for a Halloween issue, but we just couldn’t wait that long to share it with you. Dearstluv Writer shares some of her insights into aging and loneliness with her touching poem, Album of Memory. Dearstluv is one of our most sensitive voices and we are proud to include her work in this issue. We also include the first installment of Art Blue’s ORIGIN (or is it really written by Neruval, the owl?) I’m not sure if even they know, but it really doesn’t matter, because it’s a gripping read in either event. Jullianna Juliesse brings us a haunting poem, Tournee du Chat Noir, which should properly be read with a glass of absinthe in hand to fully appreciate its mysteries. Pepper Chaffe follows up on last month’s short story, The Journey, with an absolutely stunning poem, On the Wings of Maybe. Pepper is a prodigious talent and we’re lucky to have her with us. Shyla the Super Gecko returns to our pages with Be a God, where she walks us up the stairway to heaven and exhorts us to listen to our better angels. We also welcome to our magazine first-time contributor, piffy Rau, who makes an immediate, indelible impression with her moody poem, Brassai Nights. I’m still in the throes of her imagery long after reading it. And Consuela Hypatia Caldwell closes out this month’s issue with Ayahuasca Insights, wherein she shares her thoughts about ancient mysteries, as only she can. Sit back in a comfortable chair and enjoy the April issue or rez, while you feel that kiss of spring I mentioned.